As a Yale psychologist who studies human behavior, I have an interest in helping people make important change in their lives. But, bad habits are easy to get into and difficult to break. And, behavior change especially around health, such as quitting smoking, losing weight, or getting into a good exercise routine, is particularly hard. Decades of social and health psychology research indicate that intentions only have a modest impact on achieving our goals. That is, people who intend to go to the gym more frequently or to reduce their smoking do not necessarily do so. In other words, just because you say you want something to change doesn’t make it happen. Obviously. So what does promote behavior change? Many of us ask this question at exactly this time of year, thinking of what we want to be different in the new year. Well, it’s not enough to set the goal — I want to lose 2 lbs. per week. You need to monitor your performance towards that goal. A systematic review of the literature, conducted by researchers at the University of Leeds and published in Psychological Bulletin, found that monitoring one’s progress towards achieving one’s goals helps to actually achieve them. This is particularly true when those outcomes were reported or made public (say it loud and say it proud) and when the information was physically recorded. One study reported back in 1986 found some interesting findings. Women who were dieting were told to taste some chocolates. The researchers advised them to eat as many of these delicious treats as they wanted. However, half the women were told to place the eaten candy wrappers on the table, while the other group was asked to put them in the wastebasket which was already half full. Such a simple intervention, right? The results are likely of little surprise. Those who were asked to leave their wrappers on the table ate fewer chocolates. Why? Well, it could be due to what behavioral scientists, like me, refer to as demand characteristics. This essentially mean that when researchers, or people of authority, ask us to do something, many humans do as they are told. They generally want to please. Maybe. In part. 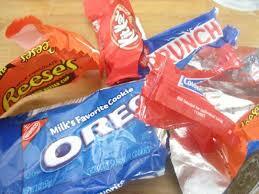 But, leaving the wrappers on the table also made it easier for the women to monitor what they had just eaten. There was no denial or minimization. The proof was right there. Could others take this lesson learned on self-monitoring and make important changes themselves? Depending on a number of factors, probably. There are many ways to self-monitor or record. There are physical logs or written diaries, personal digital assistants, websites, phone or machines, such as pedometer/meter/scale. Young or old, women and men, Democrats or Republicans monitoring progress towards one’s goals, can helps to strive towards and reach goals. The more you do it, generally, the better. Daily is better than weekly. So record away! But leave your wrappers and your recordings on the table.